Fourteen years ago, a young man walked out to the middle of the hostile Centurion track to open the innings for his team, that was playing only its second Test series in the Rainbow nation. His team had been forced to follow on after it could only muster 119 in response to South Africa’s 378 in the first innings. The captain who had scored 16 in the first innings was feeling insecure about his technique as an opener against the pace phalanx that boasted the names of Alan Donald, Makaya Ntini, Jacques Kallis and Shaun Pollock and hence, had made the 6 Test-year-old southpaw open the innings for his team. The youngster who also happened to be a wicket keeper, walked out to bat ruffling his unkempt hair wondering whether he actually belonged to the level he was playing at – for he had only produced 3 runs more than what his opening partner would soon produce, in the first innings. Living in the wilderness is all about serendipity and seizing the opportunities, for only the fittest can scrape through the battle for existence. In the skirmish to prolong life, different carnivores employ different tactics to glean enough sustenance for itself and its kind. The felines have the tactic of stalking the prey and pouncing on it without warning. The audacity and bluster of the felines in wrecking a violent rampage probably have made humanity (another predatory species) see them as a totem of valor and gallantry. The Komodo dragon, meanwhile, has a lesser titillating technique. It waits for the prey to get into its ambush region and then stealthily charges at it to spit poison into the veins by biting. Then the reptile would bask slothfully as the prey gradually gives into the deadly embrace of the poisonous protein. Once it passes out, the Komodo dragon will have its feast. While the killing style of this gigantic lizard would not attract TV channels to rave over, it gains what it wants – food for survival. The world has seen many ostentatious batsmen who are known and remembered for their bravado in the crease. Brian Lara, Sir Viv Richards, Sachin Tendulkar and Sir Don Bradman are all known for their penchant for dominance over bowlers – a style that resembles the wild felines. On the other end of the world are the batsmen in the ilk of the Komodo dragon who are opportunists who sit like storks waiting for moments to cease. Rahul Dravid and Jacques Kallis are the prime examples of such shrewd batsmen. Much like the Komodo Dragon, though their batting may not rocket fuel the TRP ratings of TV channels, they did what their team needed – scoring runs. There is another one though, in the pedigree of Dravid and Kallis whom I have intentionally omitted for the purpose of providing suspense to the opening of this article; the opening is long, I know, much like the opening ritual of the subject of this article- Kumar Sangakkara. No, this article is not about his average of 58.04 in Tests nor about the 11 double centuries he has racked up. I am not going to write about how he scored a belligerent 74 just in his first test innings in South Africa to bring in some respect to his team’s innings while the senior counterparts were practicing slow walking to the pavilion. I will stay away from scripting how he scored 230 on a seeming pitch against Pakistan in 2001/02 and how he notched up 157 on a capricious surface in Kandy against the West Indies when no one else crossed fifty and his team as a whole scored 7 runs less than him in the first innings. Neither am I going to write about his 95 against England on the perilous Kandy turf that almost gave his team a scent of victory in 2001 nor am I going to swank about his one hundred and fifty in wellington in New Zealand when his team mates were carrying bat to the crease like 12th men carrying drinks onto the field. I will completely shirk how he was wrongly given out (the umpire would later apologize publicly) on 192 against Australia in the 4th innings on a crumbling Hobart track when only one other batsman crossed 50. Let me completely ignore how his numbers are holistically better than that of Sachin Tendulkar, Brian Lara and Jacques Kallis. I will not open the Pandora ’s Box to ignite yet another “who is the best” exchange of abuses. Let me pretend to ignore the fact that he has played only 3 Test series in South Africa and only 4 tests in the West Indies in his 15-year career. This article will not dwell on how he had to bat in England in Tests during spring – where visiting teams have struggled against England’s swing bowling attack and how he didn’t play more than 3 Tests in a series. This article will never say a word about how he and his best mate sent the trumpet players of the papare band to hospital with pneumothorax, accumulating 624 runs in 2006 against South Africa. This article is not on how he had to squat and crouch for most part of the beginning of his career behind the stumps and then had to go and bat at number three. I am not going to write about the brittleness of the batting line-up he was a part of or how he was always the unofficial opener for the team, given the fact that the Sri Lankan openers always had the incorrigible habit off walking back to the pavilion as early as the first over. I will hold out from speaking about the two ICC people’s choice awards, 3 Wisden awards, one ICC test cricketer of the year award, two ODI cricketer of the year award or the cricketer of the year award in 2012. Let me for a moment forget about the amount of female fan following he still has and how he has managed to age so gracefully. May the almighty grant me the nerve to resist making any comparisons between him and any other greats. Instead, let me paint Sanga beyond just numbers and awards. The planet needs to know about how he single-handedly united a war-torn country, became an unofficial emissary of peace and harmony, gave a hegemonic regime a scare and spurred up the uninspired youth of an island that is known as the teardrop of India. Kumar Sangakkara is not just about the 12271 runs he has scored or the 179 catches he has taken. He is much more than that. His contribution to Lanka is a lot more than just numbers and trophies. He was an individualist, a social icon and a smart-alec wreathed in wisdom. His off-field laurels need to be scripted, his disparate character deserves to be documented. The world had known Sri Lanka as punching bags in the 90s. Non sub-continental teams looked upon the islanders exactly how high school bullies look at the dainty primary school kids. In sub-continent, we were the younger brother of the two elder brothers. Outside the peninsula though, the world thought they could do whatever they wanted to, to the pliable amateurs from the Indian Ocean. In 1995, Aravinda de Silva was malignly accused of tampering the ball. The men in blue protested but much like the voices of ants the world could not hear it. Murali was no-balled – we did not know what to do. Arjuna Ranatunga was called a fat c**t – we did not know how to retort. There were plenty more that failed to make it to the annals of cricket. The situation changed drastically after 1996, but yet we did not know to handle sledges and abuses until Arjuna Ranatunga decided to confront the besmirched Ross Emerson in 1998. Pugnaciousness suddenly precipitated into the Lankan mind-set. But Arjuna needed an heir to relay the late-earned nugget to. 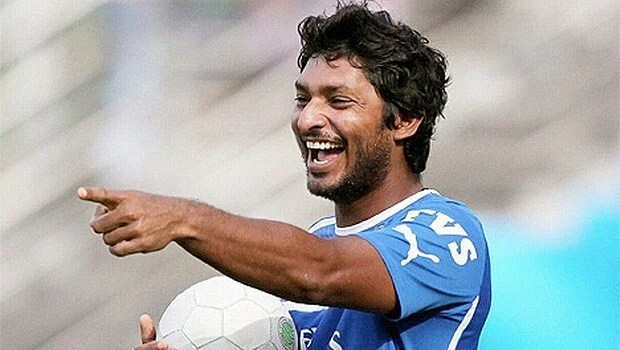 Sanga received it gleefully and stemmed the trend of being international bullies. There are two kinds of cricket fans: the ones who accept sledgings and the others who pretend not to. Verbal confrontations are inevitable as in every walk of life. Though verbal abuses are not welcome in the game of gentlemen, tactical sledging always has a grudging respect. Besides, lightherated dans can argue that sledgings make wonderful folklores to read during bedtime. There is a clichéd adage in cricket- Attack is the best defence. Sanga brought this into sledging, “either you stop or we will do the same to you.” In the 2002 tour of South Africa, the hosts would receive an earful from the Lankans and end up being more flustered than the initial victims. The south paw is a classy sledger. Someone who had the ability to turn innocuous one-liners into pernicious remarks. His sledgings are often curt and brusque that they behave like a drop of poison in a glass of milk- tiny but can spread into your brain leading it in to a tempestuous state. He does not use vile or abusive language which have no place in a civilized sport like cricket but deploys sharp wits and good humours that can hurt the ego of the unfortunate victim. Just in his 2nd Test series at home, the legendary left hander ruffled the feathers of the tranquil Mike Atherton. A controversial catch in the first innings had made Atherton call Sangakkara a ‘cheat’, to which Sanga reminded Atherton of ‘the dirt in the pocket’ incident. A finger wagging gala succeeded it and Sanga capped off his dominance over the visitor by successfully rendering a swashbuckling 95. He manifested to the world that Asians can dish out sledgings too. Who would dare to sledge while batting? Sanga did it once by getting underneath the skin of Gareth Batty, the English off-spinner in Kandy when he came onto bowl, quizzing him “Where’s Robert Croft, England’s best offspinner?” – a kind of sledging that can incinerate egoistic battles even among team members. In the same match, Mark Boucher was given a lecture in semantics. The South African wicket keeper unable to bear the ceaseless multi-barrel verbal attack from Sangakkara, strolled down the track pretending to go towards Shaun Pollock at the other end and then walked back saying, “Don’t mind, the Dog’s are shouting!”. Sanga let his calm demeanour be known, “Dog’s don’t shout mister, they Bark!!!”. The other aspect of sledging of Kumar is that his sledgings are sired from careful research. As to how he manages to dig deep into dressing rooms to espy dressing-room skirmishes is a million-dollar question. The habitually hard-hearted Jacque Kallis was left fuming when Sanga referred to a widely misinterpreted quote from Kallis about Sir Don Bradman. His acerbic eloquence once again rolled along a cricket ground in 2004, when he noticed that the Indian spinner Harbhajan Singh preferred short sleeves while batting but not while bowling. “Bhaji you look good in your short sleeves, why don’t you wear them when you bowl too?” The spinner was fresh from being reported for alleged chucking.